A luxury pool party we’d all love to attend. 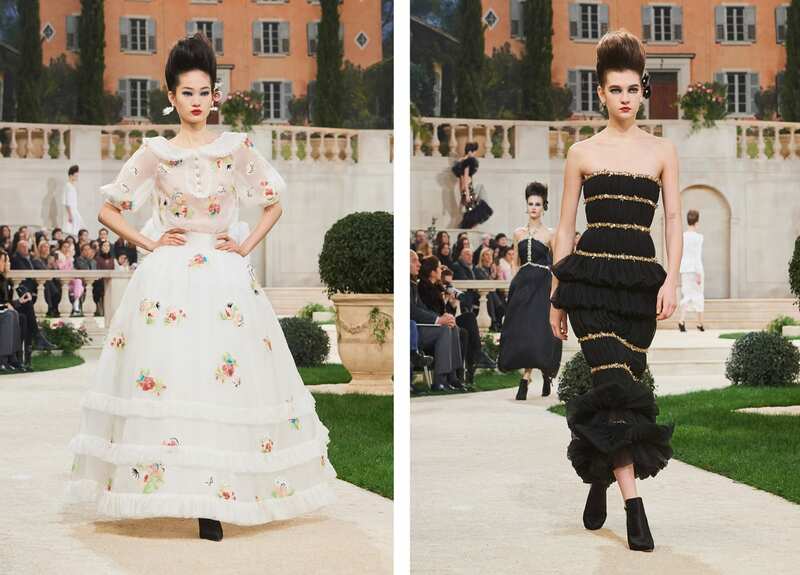 Karl Lagerfeld gave the audience a reprieve from the icy outdoors and brought summer back by way of a grand Italian villa. The collection consisted of handwoven tweeds, pleated hemlines, light floral embroidery, ostrich feathers, ruffles and cardigan jackets. However it was the bride that stole the show in the form of Vittoria Cerretti resplendent in a silver embroidered floral one-piece swimsuit and draping veil. A ceremony for the ages. Roll up, roll up, to the Dior Big Top Circus. A fantastical affair by Maria Grazia Chiuri for Christian Dior’s Haute Couture SS 19 runway. Models donned sequinned head caps and dark eyeliner, like fashion-forward circus performers. 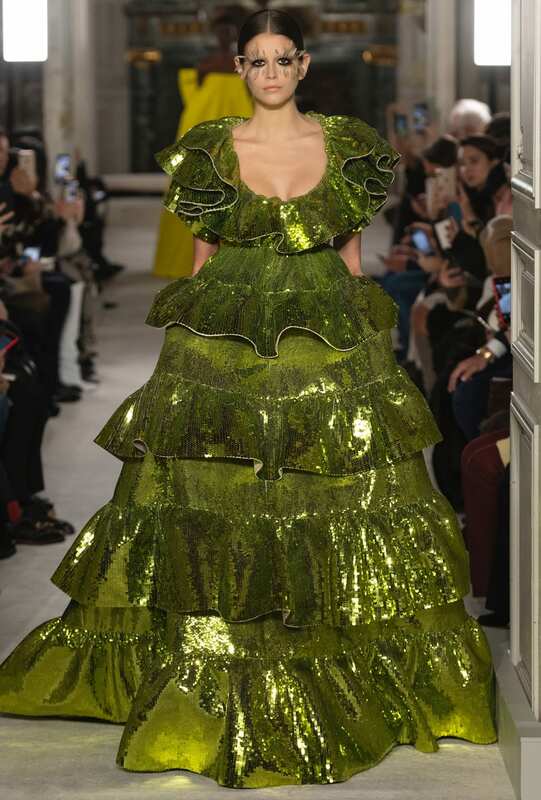 The collection featured gold cascading gowns, sequin embellishments and beautiful suited tailoring. Throw in the jaw dropping acts of Mimbre, London’s all-women troupe of circus acrobats, and you’ve got a show to be remembered. 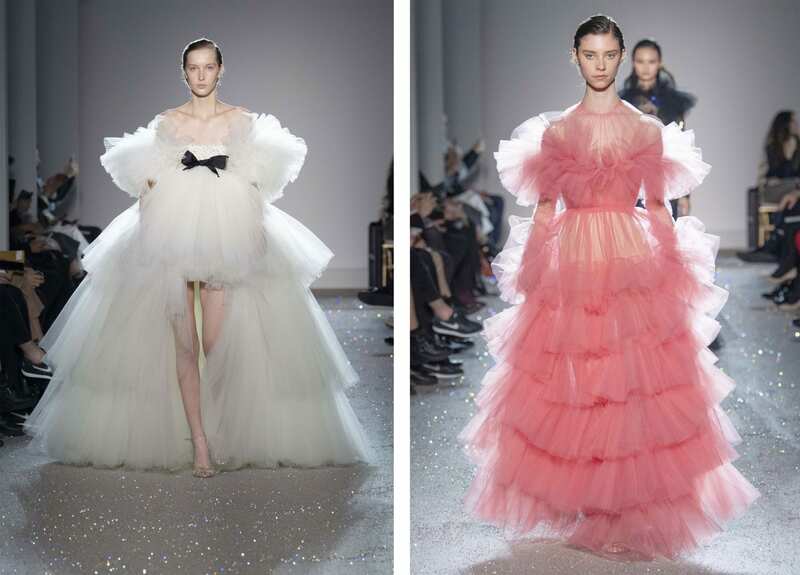 Giambattista Valli brought a sea of alternating silhouettes for Haute Couture SS 19. 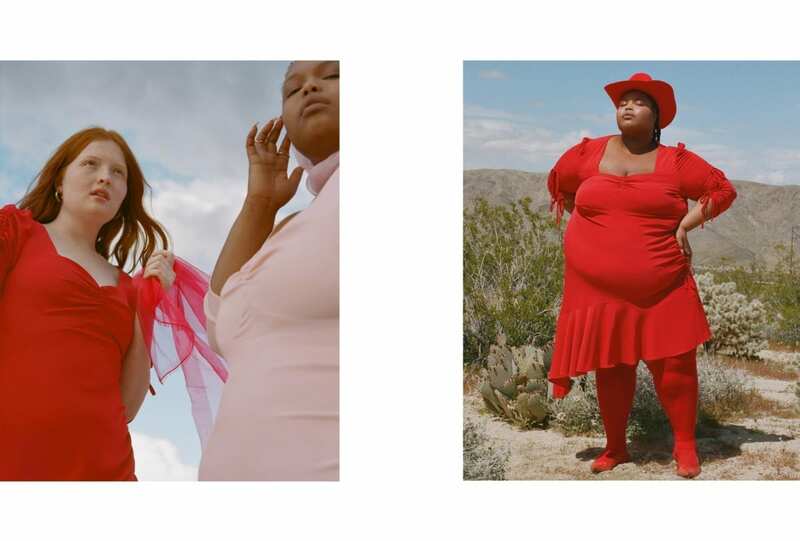 From the ever iconic voluminous tulle tiered gowns and long trains to the slimmer, shorter dresses with puff sleeves and shoulders. Add in the mix some sequins, embroidery and array of eclectic headpieces. One of each please. Pieces for now and forever. 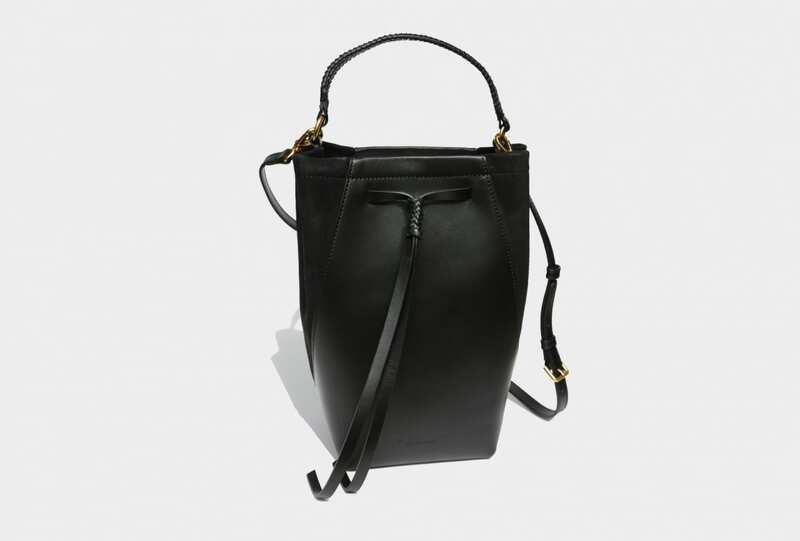 A sleek, modern and sophisticated collection by Clare Waight Keller for Givenchy’s Haute Couture SS 19 collection. 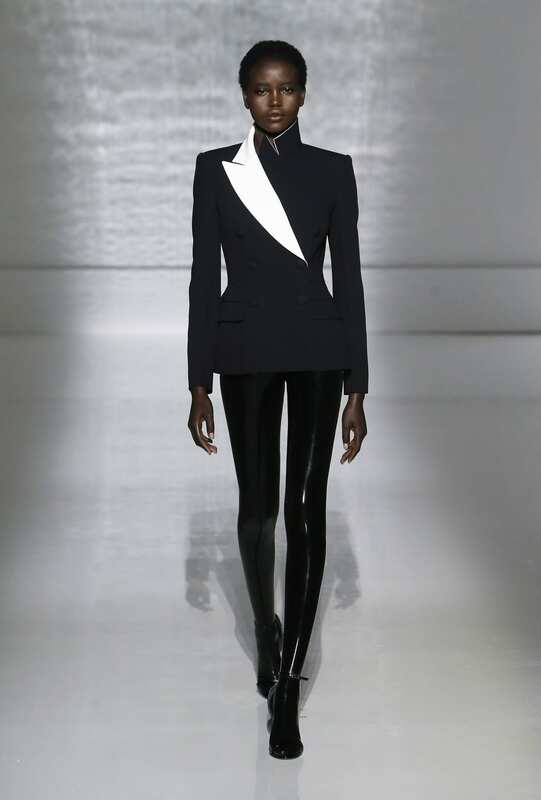 Architectural tailoring showed contrasting lapels on blazers, oversized bows that seconded as backpacks, structured lace and latex pieces that looked almost painted on. Pops of colour made an appearance too, but weren’t overpowering, for pieces to treasure always. A show that brought even Celine Dion to tears, with a show stopping closing look worn by none other than Naomi Campbell. 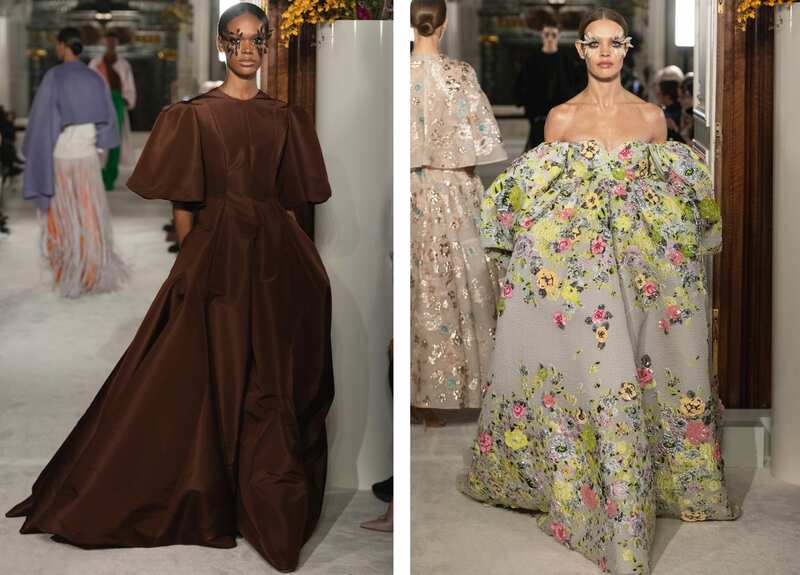 Pierpaolo Piccioli’s Valentino Haute Couture runways have been a favourite these past few seasons, and with his SS 19 offering full of rich colour, heavy voluminous gowns, ruffles, lace and florals, this collection was no different. The highlight? Those petals delicately framing the models eyes, extending their lashes far and beyond. A magical, tear-jerking affair. Let the dresses do the talking. 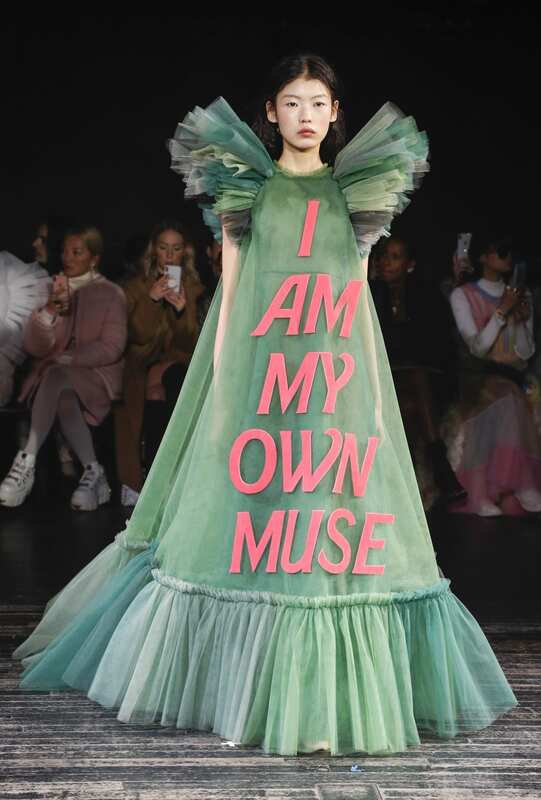 Viktor & Rolf are saying what we’re all thinking. 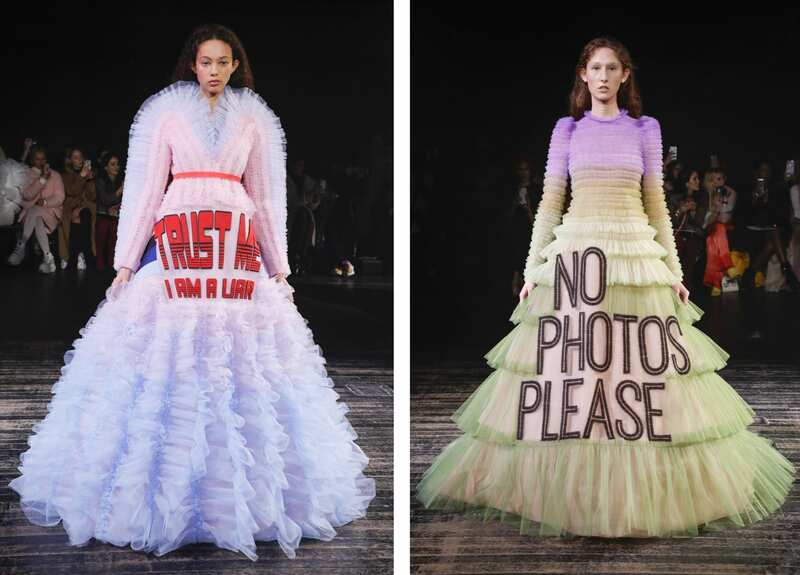 The aptly named Fashion Statements Haute Couture SS 19 collection by Viktor Horsting and Rolf Snoeren showcased voluminous bright hued tiered tulle gowns featuring the words we’ve all been dying to say. From No photos please, Give a damn, I’m sorry I’m late I didn’t want to come, I am my own muse and, our personal favourite, No.